This article is about the painter. For the singer, see Joni Mitchell. For the computer scientist and inventor, see Joan L. Mitchell. 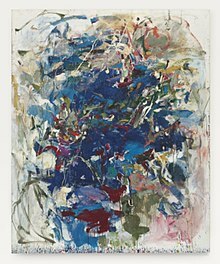 Joan Mitchell (February 12, 1925 – October 30, 1992) was an American "second generation" abstract expressionist painter and printmaker. She was a member of the American abstract expressionist movement, even though much of her career took place in France. Along with Lee Krasner, Grace Hartigan, Helen Frankenthaler, Shirley Jaffe, Elaine de Kooning, and Sonia Gechtoff, she was one of her era's few female painters to gain critical and public acclaim. Her paintings and editioned prints can be seen in major museums and collections across the United States and Europe. Mitchell was born in Chicago, Illinois, the daughter of dermatologist James Herbert Mitchell and poet Marion Strobel Mitchell. :21 She enjoyed diving and skating growing up, and her art would later reflect this athleticism; one gallery owner commented that Mitchell "approached painting almost like a competitive sport". Mitchell frequently attended Saturday art classes at the Art Institute and eventually would spend her summers of later adolescence in a Chicago Art Institute run art colony, Ox-Bow. She lived on Chestnut Street in the Streeterville neighborhood and attended high school at Francis W. Parker School in the Lincoln Park neighborhood. Mitchell studied at Smith College in Massachusetts and The Art Institute of Chicago, where she earned her BFA in 1947 and her MFA in 1950. After moving to Manhattan in 1947, she wanted to study at Hans Hofmann's school in New York but, according to Jane Livingston in her 2002 essay ("The Paintings of Joan Mitchell"), Mitchell attended only one class and declared, "I couldn't understand a word he said so I left, terrified." A $2,000 travel fellowship allowed her to study in Paris and Provence in 1948—49, and she also traveled in Spain and Italy. Mitchell is recognized as a principal figure—and one of the few female artists—in the second generation of American Abstract Expressionists. By the early 1950s, she was regarded as a leading artist in the New York School. In her early years as a painter, she was influenced by Paul Cézanne, Wassily Kandinsky, Claude Monet, Vincent van Gogh, and later by the work of Franz Kline and Willem de Kooning, Jean-Paul Riopelle, among others. Her paintings are expansive, often covering multiple panels. Landscape was the primary influence on her subject matter. She painted on unprimed canvas or white ground with gestural, sometimes violent brushwork. She has described a painting as "an organism that turns in space". According to art historian Linda Nochlin, the "meaning and emotional intensity [of Mitchell's pictures] are produced structurally, as it were, by a whole series of oppositions: dense versus transparent strokes; gridded structure versus more chaotic, ad hoc construction; weight on the bottom of the canvas versus weight at the top; light versus dark; choppy versus continuous strokes; harmonious and clashing juxtapositions of hue – all are potent signs of meaning and feeling." Mitchell said that she wanted her paintings "to convey the feeling of the dying sunflower" and "some of them come out like young girls, very coy ... they're very human." Mitchell was very influenced by her feelings and incorporated it into her artwork. She even compared these feelings that influenced her paintings to poetry. 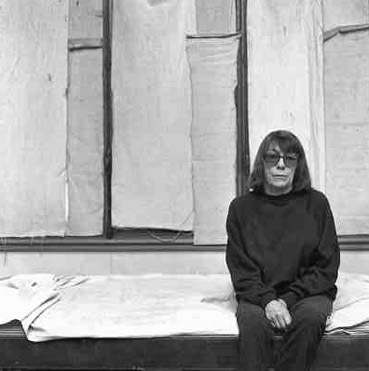 Some would even compare it to lyric poetry, according to the essay The Lyrical Principle: On Joan Mitchell by Dore Ashton. In 1951, Mitchell's work was exhibited in the landmark "Ninth Street Show" alongside that of Jackson Pollock, Willem de Kooning, and Hans Hofmann. In 1952, she had her first solo exhibition at the New Gallery. In October 1957, the first major feature on her work method appeared in ARTnews. In 1972, Mitchell staged her first major museum exhibition, entitled “My Five Years in the Country,” at the Everson Museum of Art in Syracuse, New York. December 1988 saw Mitchell's first retrospective exhibition, which she referred to as being art-historized live. :392 It featured 54 paintings produced from 1951 to 1987. Mitchell's first solo show at Robert Miller Gallery (of nine paintings) ran from October 25 to November 25, 1989. The second Robert Miller Gallery solo ran from March 26 to April 20, 1991, proved to be very popular, and featured paintings described by John Russell of The New York Times as "self-portraits by someone who has staked everything on autonomous marks that are peculiar to herself". Later retrospective surveys include “Joan Mitchell Pastels,” Whitney Museum of American Art, New York (1992); “The Paintings of Joan Mitchell,” Whitney Museum of American Art, New York (2002); and “The Paintings of Joan Mitchell,” Birmingham Museum of Art, Alabama (2003), travelled to the Modern Art Museum of Fort Worth, Texas and The Phillips Collection, Washington, D.C. through 2004. Mitchell's work is part of many public collections including Museum of Modern Art, New York; Whitney Museum of American Art, New York; Governor Nelson A. Rockefeller Empire State Plaza Art Collection, Albany, NY; Art Institute of Chicago; Walker Art Center, Minneapolis; Albright–Knox Art Gallery, Buffalo; Crystal Bridges Museum of American Art, Bentonville; Hirshhorn Museum and Sculpture Garden, Washington, D.C.; Smithsonian American Art Museum, Washington, D.C.; Tate Gallery, London; Fondation Cartier pour l'Art Contemporain, Paris; The Ulster Museum, Belfast, Northern Ireland and the San Francisco Museum of Modern Art. Established in 1993 as a not-for-profit corporation, the Joan Mitchell Foundation awards grants and stipends to painters, sculptors, and artist collectives; past grantees have included Nicole Eisenman (1994), Glenn Ligon (1996), Troy Brauntuch (1999), Karen Kilimnik (1999), Sarah Morris (2001), Nyame Brown (2003), Mark Dion (2005), Julie L. Green (2011), Amanda Ross-Ho (2013), Ann Purcell (2014), and Michi Meko (2017). The foundation is located in Manhattan, NY at 137 West 25th Street. The Joan Mitchell Foundation also sponsors an Artist-in-Residence Program at the Joan Mitchell Center in New Orleans, Louisiana, located at 2275 Bayou Road in the Faubourg Tremé neighborhood. Untitled (1960) sold at auction for $11.9 million in 2014, a record for a female artist. Already during her lifetime, Mitchell was rewarded with a considerable degree of commercial success. Between 1960 and 1962, Mitchell earned over $30,000 in art sales, a considerable figure for a woman painter at that time. In 2007, the Art Institute of Chicago sold Ste. Hilaire, 1957 at Christie's New York for $3.8 million. In 2012, a record of €5.2 million ($7 million) — then the second-highest price achieved by a female artist at auction — was set at Christie's Paris for an untitled 1971 painting. That year, Mitchell's canvases were the two most expensive works by any woman artist sold at auction, according to auction database Artnet. Works by Mitchell fetched $239.8 million in sales from 1985 through 2013, according to figures compiled by Bloomberg. At Christie's New York in 2014, Mitchell's untitled 1960 abstract painting sold for $11.9 million, surpassing the high estimate and setting an auction record for the artist. The result also established a new record for an artwork by any female artist at auction, formerly held by Berthe Morisot's Apres le dejeuner (1881). This price in turn was exceeded by the $44.4 million achieved by the 1932 painting Jimson Weed/White Flower No 1 by Georgia O'Keeffe on 20 November 2014. In June 2018, nine of Mitchell's paintings were expected to sell for more than $70 million at the world's largest modern art fair, Art Basel. Mitchell married American publisher Barney Rosset in 1949 in Paris. Rosset was a Chicago-born American entrepreneur who became, at Mitchell's urging, the owner of the publishing house Grove Press, perhaps best known as the American publisher of the novel Tropic of Cancer by Henry Miller. They divorced in 1952. Although she remained active in the burgeoning art scene of 1950s New York, Mitchell spent increasing amounts of time travelling and working in France. In 1955, Mitchell moved to France to join Canadian painter Jean-Paul Riopelle, with whom she had a long, rich, and tumultuous relationship (from 1955 to 1979). They maintained separate homes and studios, but had dinner and drank together daily. They first lived in Paris, and then moved west to the town of Vétheuil, near Giverny, Claude Monet's home. In 1967, Mitchell inherited enough money to purchase a 2-acre estate in Vétheuil. In Paris, Mitchell had a circle of artist friends, such as the composer Gisèle Barreau and painters such as Kate Van Houten, Claude Bauret Allard, Michaële-Andréa Schatt, Monique Frydman, Mâkhi Xenakis, Shirley Jaffe, Zuka, and Katy Crowe. Mitchell was a great admirer of Henri Matisse, especially the vividness of his color and vivacity of his line, once claiming that, "If I could paint like Matisse, I'd be in heaven." Mitchell's New York dealer, Xavier Fourcade, had been diagnosed with AIDS and, in 1986, travelled to France to undergo treatment. Fourcade and Mitchell visited Lille in December to view an exhibition of works by Matisse from the State Hermitage Museum, Leningrad. The trip resulted in the Lille cycle of paintings, followed, after Xavier Fourcade's death on April 28, 1987, by the Chord paintings. The River, Lille and Chord paintings were exhibited at Galerie Jean Fournier, Paris between June 10 and July 13, 1987. A passionate inner vision guided Joan's brush. Like her peer Cy Twombly, she extended the vocabulary of her Abstract Expressionist forebears. She imbued their painterliness with a compositional and chromatic bravery that defiantly alarms us into grasping their beauty. ^ Birmingham Museum of Art (2010). Birmingham Museum of Art: A Guide to the Collection. London: Giles. p. 243. ISBN 978-1-904832-77-5. Archived from the original on 2011-09-10. Retrieved 2011-06-24. ^ a b c d e f g h Albers, Patricia (2011). Joan Mitchell: Lady Painter. New York: Alfred A. Knopf. ISBN 9780375414374. ^ a b c Suzanne Muchnic (June 12, 2011), Book Review: 'Joan Mitchell: Lady Painter' by Patricia Albers Los Angeles Times. ^ a b "She's About to Be the Belle of Basel, Decades After Her Death". Bloomberg.com. 2018-06-08. Retrieved 2018-06-08. ^ Joan Mitchell Crystal Bridges Museum of American Art, Bentonville. ^ Joan Mitchell: A Painter Under the Influences Los Angeles Times, April 26, 1994. ^ Livingston, Jane; Mitchell, Joan; Nochlin, Linda; Lee, Yvette Y; Whitney Museum of American Art (2002-01-01). The paintings of Joan Mitchell. New York; Berkeley, CA: Whitney Museum ; University of California Press. ^ a b "Joan Mitchell", with Cora Cohen and Betsy Sussler, Bomb magazine, 17/Fall 1986. Retrieved October 24, 2012. ^ exhibit-e.com. "Joan Mitchell - Exhibitions - Cheim Read". www.cheimread.com. Retrieved 2018-06-08. ^ Nochlin, Linda (2002). "Joan Mitchell: A Rage to Paint". In Livingston, Jane (ed.). The Paintings of Joan Mitchell. New York: Whitney Museum of American Art. p. 49. ISBN 0520235703. ^ Nochlin, Linda (2002). "Joan Mitchell: A Rage to Paint". In Livingston, Jane (ed.). The Paintings of Joan Mitchell. New York: Whitney Museum of American Art. p. 55. ISBN 0520235703. ^ Ashton, Dore (Fall 2008). "The Lyrical Principle: On Joan Mitchell". Essay: 17 – via Academic Search Premier. ^ Szalai, Jennifer (2018-09-26). "'Ninth Street Women' Shines a Welcome New Light on New York's Postwar Art Scene". The New York Times. ISSN 0362-4331. Retrieved 2019-02-15. ^ Livingston, Jane (2002). The Paintings of Joan Mitchell. Berkeley and Los Angeles, California: University of California Press. p. 21. ISBN 0-520-23568-1. ^ Sandler, Irving (October 1957). "Mitchell paints a picture". ARTnews. 56 (6): 44–47, 67–70. Retrieved November 23, 2012. ^ Bernstock, Judith (1988). Joan Mitchell. Hudson Hills Press in association with the Herbert F. Johnson Museum of Art, Cornell University. ISBN 0933920814. ^ a b c "Bio". Joan Mitchell Foundation. Retrieved November 23, 2012. ^ Russell, John (April 12, 1991). "Paintings That Liberate the Viewer's Imagination". The New York Times. Retrieved November 23, 2012. ^ a b Joan Mitchell: The Last Decade, November 13 – December 23, 2010 Gagosian Gallery, Los Angeles. ^ Rothfuss, Joan and Elizabeth Carpenter (2005). Bits & Pieces Put Together to Present a Semblance of a Whole: Walker Art Center Collections. Walker Art Center. pp. 392–393. ISBN 0-935640-78-9. ^ a b Ellen Gamerman and Mary M. Lane (April 18, 2013), Women on the Verge Wall Street Journal. ^ Foundation, Joan Mitchell. "Joan Mitchell Foundation » Artist Programs » Artist Grants". joanmitchellfoundation.org. Retrieved 2018-01-17. ^ Painters and Sculptors Grant Program Recipients Joan Mitchell Foundation. ^ "Ann Purcell – Paintings from the 1970s". Retrieved 15 January 2017. ^ "Atlanta artist Michi Meko's work is "the contemporary experience of black life and survival"". Atlanta Magazine. 28 February 2018. Retrieved 21 April 2018. ^ "Programs". Joan Mitchell Foundation. Retrieved 18 November 2015. ^ Joan Mitchell, Untitiled (1960) Christie's New York, Post-War & Contemporary Evening Sale, 13 May 2014. ^ a b Joan Mitchell, Ste. Hilaire (1957) Christie's Post War and Contemporary Art Evening Sale, 13 November 2007, New York. ^ a b Hilarie M. Sheets (July 17, 2008), Artist Dossier: Joan Mitchell Art+Auction. ^ Katya Kazakina (August 6, 2013), Top 20 Female Artists Fetch $1.8 Billion; Mitchell Leads Bloomberg. ^ "Sale 2847 Lot 32". Archived from the original on 2014-05-14. Retrieved 2014-05-14. ^ Crow, Kelly. "Christie's Art Sale Brings In Record $745 Million". Wall Street Journal. ^ Kazakina, Katya. "Billionaires Help Christie's to Record $745 Million Sale". Bloomberg News. Archived from the original on 14 May 2014. ^ a b David Pagel (November 19, 2010), Art Review: 'Joan Mitchell/The Last Decade' at Gagosian Gallery Los Angeles Times. ^ "Joan Mitchell Becomes the Sunflower". The New York Sun. Retrieved 2018-06-08. ^ Joan Mitchell, Aires Pour Marion (1975–76) Christie's New York, Post-War & Contemporary Evening Sale, 13 May 2014. ^ Kertess, Klaus (June 16, 2002). "Her Passion Was Abstract but No Less Combustible". The New York Times. Retrieved November 23, 2012. ^ Kimmelman, Michael (September 20, 1992). "The Many Moods Of Henri Matisse". The New York Times. Retrieved November 23, 2012. ^ a b c Livingston, Jane (2002). The Paintings of Joan Mitchell. New York, Berkeley, CA: Whitney Museum, University of California Press. ISBN 0520235681. Sandler, Irving (October 1957). "Mitchell Paints a Picture". ARTnews. Archived from the original on 15 May 2014.